In 2004, scientists observing a baboon troop found that the monkeys' culture could change dramatically, and enduringly, for the better. And all it took was massive amounts of death. 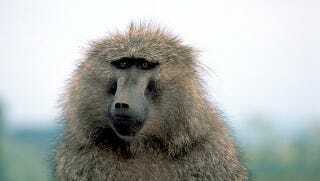 Life isn't particularly nice for you if you're a baboon. If you aren't the victim of a lion or a hunter you will almost certainly be the victim, at some time, of a fellow baboon. It won't even be an enemy baboon. In troops of baboons, fights are common. Dominant males regularly lash out at less-dominant males, as well as females and juveniles. As for the underlings, they nurse their grudges and attempt to form alliance to attack the dominant males. There's good reason to become a dominant male. They enjoy the widest choice of mates and the widest choice of food. If other baboons within the same troop encroach on what they consider their resources, they will inflict punishment. The other baboons learn to stay away, which is why the beta members of a troop in Kenya weren't scavenging at a dump near a tourist encampment when the trash there became contaminated with bovine tuberculosis. The dominant males all became infected, and were, in short order, wiped out. The troop, known as the Forest Troop, struggled on with a greatly-reduced population of males, and a lot of females and juveniles. What followed was a remarkable cultural shift. Fighting and slapping went out. Grooming, and other positive social re-enforcement, came in. There was still some conflict, but the culture of violence faded away. The troop became more peaceful, cooperative, and amiable. That was in the early 1980s. When a report on the troop came out in 2004, the Forest Troop had maintained its peaceful ways. New males had joined the group, and the males who survived the plague had either moved on or died off. Somehow, they assimilated to the peaceful culture of the group instead of changing it. The elimination of the most violent in the group seems to have precipitated a lasting shift towards peace. It puts one in a quandary, doesn't it? The phenomenon seems to suggest that it is possible to change a society for the better. Unfortunately, the mechanism seems to be the widespread slaughter of the most violent members of that society.